There are many forms of metal roofing, one of the most common style is standing seam metal roof. 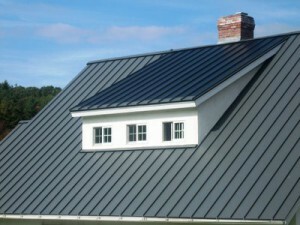 Standing seam metal roof is mostly made up of Galvalume steel. Standing seam proves to be highly effective in increasing your roof age. Commonly there are four different styles of standing seam metal roof detail type known as Double Lock seam, Symmetrical seam, one piece snap lock interlock, two piece snap lock interlock. Architectural details of all these are described below. Metal roofs look great on residential properties. Double lock seam also known as mechanically seamed hydrostatic panels. In this style two standing seam roof panels are adjoined with a mechanical seaming tool. Such seam has high airstream resistance. It can also be curved. Symmetrical standing seam roof is the most innovative of all the options available. Keeping in mind all the options available in standing seam roof types and by comparing their advantages and disadvantages, symmetrical standing seam roof proves out to be the best. It can also be curved and can be tapered if needed. Such seam can handle high stream resistance more than double lock seam. Symmetrical seam allows thermal movements and can be easily installed with the help of fixed clips. Such seam is suited for almost every type of roofs. One piece snap lock interlock is the interlocking of two seam panels. Interlocking is such that it seems like seam panels are mechanically interlocked. These standing seams are not suited in the areas where there are more of high wind areas. Not much utilization of such seam is there in areas where windstorms are common. One piece snap lock interlock is not much in use nowadays. Roof slopes of 3:12 or greater is the roof where such seam is suitable. Pressure handling at corners is less in these seams and so it is not suited for the high wind areas. Two piece snap lock interlock is comparatively easier to install as this seam can be installed bi-directionally. This type of seam needs panel as well as cap. But with the introduction of symmetrical seam in the market, two piece snap lock interlock demand has gone low and is now less in use. Basically these are the 4 types of standing seam available in the market and are used commonly. Tee panel, curved or compound curved or tapered tee panel, high seam tee panel, zee lock and zee lock double lock are also types of various standing seam metal roofing. Different standing seam have different capabilities and they are designed according to various criteria, keeping in mind the building codes. For proper metal roofing you first need to select from metal roof products and then second most important step is their proper installation. Installation of metal roofs plays an important role as it decides the efficiency of roof. There are many standing seam metal roof manufacturers available in the market but choosing the best among them is important. As the life of roof depends on the seam, so keeping in mind the thermal movements of various metals and their properties is important. Choosing the right manufacturer guarantees you about the quality of metal roof. So it is a critical decision to choose among various manufacturers. Choosing the right standing seam metal and knowing the exact design that can be installed at your specific region type is important for efficient roofing. Designs can clearly be examined with standing seam metal roof revit i.e. the three dimensional view of seam.